Floornature interviews Juergen Riehm, partner at 1100 Architect, which he cofounded with David Piscuskus in New York in 1983. The public opening of their latest project, the Children’s Library Discovery Center in New York, gave us the opportunity to discuss the design poetics of a great architectural practice, which now also has an office in Frankfurt. 1100 maintains a constant focus on sustainability and Energy efficiency as requirements for achieving quality and beauty in a work of architecture. Juergen Riehm also discusses the design for the renovation and expansion of the Brooklyn Detention Center in New York. Starting with a constant focus on sustainability and energy efficiency as particular requirements for achieving quality and beauty in a work of architecture, Juergen Riehm also discusses the controversial new Brooklyn Detention Center in New York. Conventional libraries have little natural lighting and very limited interaction with the outdoors. What made you build the Children’s Library Discovery Center with big clear and translucent windows and such a great ability to interact with what is going on outside on the street? The idea for the design of the façade was guided by a number of goals. Libraries today are not severe institutions closed up in introverted buildings, but rather information centres that serve for the community. In this sense, we wanted to create an open, interactive place, that has an intense relationship with the world outside. 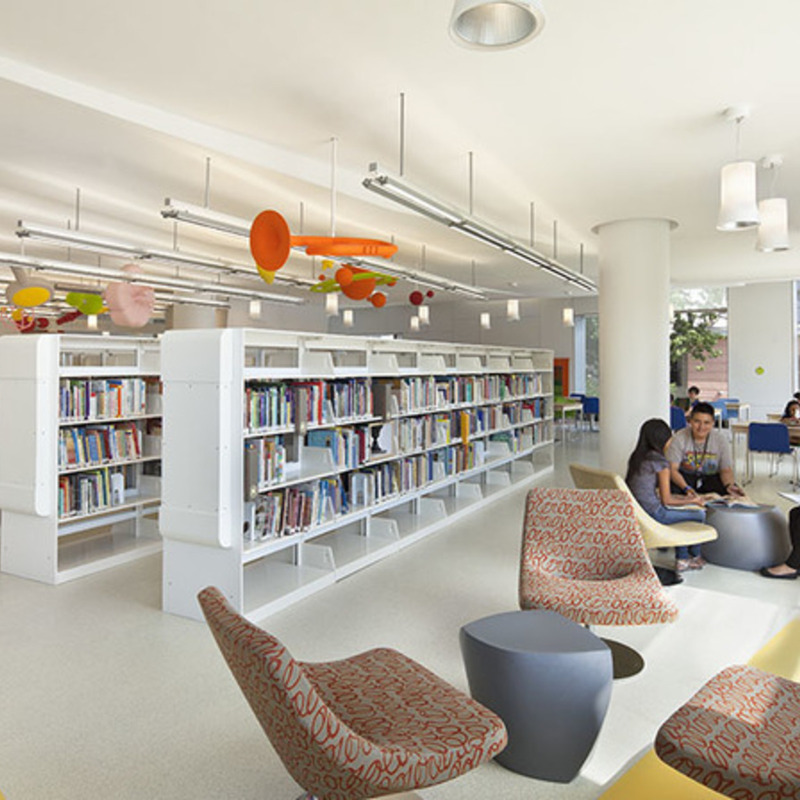 The Children’s Library Discovery Center is a brightly lit place for socialisation that is attractive to the multicultural population of Queens. The graphics on an architectural scale designed by Lee H. Skolnick Architecture + Design Partnership are strictly correlated with the design of the internal volumes and draw the spaces in a way which emphasises their width. Might we call this an example of integrated design of wall and floor decorations, objects, signage and architecture? The graphic concept followed upon the architectural concept, and we worked in close collaboration with Lee H. Skolnick Architecture + Design Partnership. Architecture and graphics are connected by the project's key concept of “Discovery“, or living by discovering, which also gives the project its name. The walls of the Brooklyn Detention Center in New York, so richly packed with signs, materials and forms, contrast with the traditional image of prisons, governed by the reiteration of the window module, the use of a single material, and anonymous façade geometry. What do you see as the key elements in designing the prison of the new millennium, in view of the issues of lack of space and prisoners’ alienation?? The Brooklyn Detention Center is a pretrial detention facility, where the detainees’ characteristics and requirements are very different from those of a prison. As in any newly constructed public building in an urban setting, the 21st-century detention facility is a response to the demand for high-quality sustainable design. For the Brooklyn Detention Center, our design integrates environmental parameters with the goal of creating a safe, balanced environment for both detainees and staff. Standing at the corner of Atlantic Avenue and Smith Street, the Brooklyn Detention Center is intended to be a landmark. How can the BDC be a symbolic element identifying an urban place in a positive way? The design of the Brooklyn Detention Center responds to the court building directly across from it, and hat to fit in with the sorrounding residential and commercial areas. We propose commercial spaces at street level along Atlantic Avenue with the precise intention of creating a link to the community, and using the building as a symbol of downtown Brooklyn's dynamic civic and commercial center. Geotechnical Engineer: Pillori Associates, P.A. Civil Engineer: Matrix New World Engineering, Inc.
Fire Life Safety Consultant: Schirmer Engineering Corp.